(CNN) - Barack Obama is hanging onto leads in several battleground states as well as a handful of traditionally red states won by President Bush in 2004, CNN's average of several recent state polls shows. According to a string of new polls of polls from CNN, Obama holds narrow leads in Ohio, Missouri, Florida, Nevada, and Virginia. John McCain meanwhile is hanging onto his lead in Indiana and West Virginia. CNN's polls of polls are statistical averages of several recent surveys from each state. They do not carry margins of error. In Ohio, the state no Republican has won the White House without, Obama is holding a 4 point lead, 50 percent to 46 percent. That's one point narrower than a CNN Ohio polls of polls last week. In Missouri, the state that voted for President Bush twice, Obama holds a 1 point lead over McCain. A CNN average of recent polls last week showed the race tied in Missouri. Obama is holding onto a 2 point lead in Florida meanwhile, 48 percent to 46 percent. That's one point narrower than the race was last week at this time. In Nevada, Obama has a 4 point lead, 49 to 45 percent - a lead that hasn't changed over the last week. In Virginia, a state that hasn't voted Democratic in over 4 decades, but one that has been increasingly trending Democratic, Obama holds a 5 point lead, 50 to 45 percent. That's 3 points narrower than Obama's lead there last week, according to a CNN poll of polls then. McCain meanwhile has a 1 point lead in Indiana, 47 to 45 percent, another state that hasn't voted Democratic since the 1960's but one that the Obama campaign has heavily targeted. McCain also has an 8 point lead in West Virginia, 50 to 42 percent, a lead that is 6 points higher than it was this time last week. That latest round of poll results shows McCain faces an uphill climb in the final week of his presidential campaign. VOTER FRAUD by ACORN is really going to cause some headaches in this election. With over 200,000 questionable votes in Ohio alone. If Obama doesn't win Ohio by at least 400,000 votes then the people of Ohio should be screaming VOTER FRAUD, and DEMAND an investigation. The question is; Will the Buckeye state be forever remembered as the ACORN state? McCain wants to cut defense spending as well, in fact he wants a spending freeze, except for the tax cuts for big corporations and CEOs.Change is coming. 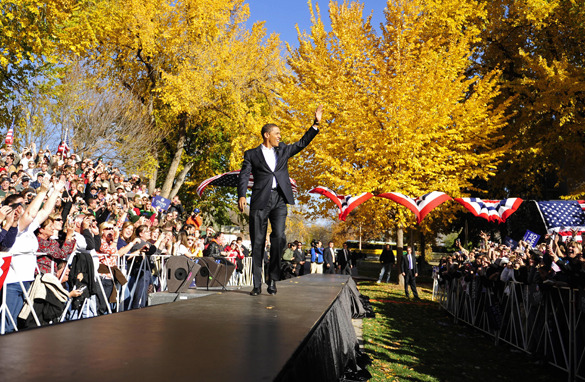 The FINANCIAL TIMES endorsed Barack Obama for President. Senator Obama has my full support and my vote! I will campaign for him all week to get out the vote. How anyone could vote for the Palin/McCain ticket is beyond me. He has led the most negative campaign in history and Palin is the most stupid VP pick ever. She even beats Quayle. I am sick of the two of them. Being a Republican all my life and we come up with these two idiots. It's the first time I voted Demcratic. If McCain would get in, we are all doomed. He is head of he PNAC and would start wars all over the place. NO MCCAIN/PALIN. REPUBLICANS WAKE UP. Wow... the idiocy of these posts is astonishing. I am waiting for McCain/Palin, or any of their supporters, to tell me why we should vote FOR McCain. All I hear are internet rumors and smears against Obama, and as for McCain, all he has left is to grossly mischaracterize Obama's plan in a desperate attempt to fear people into voting against Obama. Again, nothing about why we should vote for him. In one breath, he says Obama is socialist, and in the next, he says we should buy up bad mortgages to save the economy. In one breath he says he will reach across the aisle, and in the next he slams the democrats and embraces the extreme right of the republican party. It's a shame...I don't think McCain is a bad guy, he has just sold out to the conservatives. If he were truly a Maverick, he would ditch the wingnuts running his campaign and move back toward the middle for the sake of true progress for our country. Americans are too smart to let the Repugs get over on us again..... we will vote – the Repugs have taken our tax dollars, home, & have our solders fighting a futile war...... all they while getting richer while we suffer daily.... this has to stop immediately! nothing cracks me up in here more than the republican shills that come onto these boards and say stuff like "This former democrat for mccain"
Both McCain and Obama are poor choices to lead our nation. The Republicans gave us an old pol who goes whichever the way the political wind is blowing; the democrats have given us an extreme narcissist with a messianic complex who has really no record on which to make a determination about whether he is qualified to lead our nation in these difficult times. Now is the time for serious people to answer serious questions, I don’t think either man is capable of doing so. Will we ever have the honor to cast a vote for someone for whom the best interest of the nation is paramount? Self aggrandizement is not a good reason to run for President. Nice phrasing CNN. "Polls show troubling signs" = Latest polls show McCain gaining ground. Not a single poll you just mentioned had McCain losing ground. Who edits this crap you write? Polls are good, but they are not a guarantee! Get out an vote!!! Within two years of his election to office, and with the support of a democratic Congress, Obama will re-institute the fairness doctrine and run Fox news out of business by demanding rebuttal time for nearly anything it reports, while leaving the liberal MSM alone. His administration will also not grant conservative media access of any kind. By then, with the economy in shambles, he and the democratic party will announce that the "failed republican policies of the last 8 years (never mind that democrats controlled the house and senate for the last two), have made it impossible to govern the country in the short term, so we are suspending presidential elections until such time as the country is stabilized." Wealth redistribution has been tried often in South America, yet, somehow, the barrios remain. I am voting for Obama, its the least I can do to stop the madness of the last 8 years. I do have one suggestion, stop another madness by banning ALL campaign advertising 48 hrs before election day, this will give the electorate time to digest everything that has been thrown at them and allow for a more accurate decision on who and what to vote for. My Vote Goes To Obama! Mccain Does Not Have A Plan For This Country, He Only Has A Plan To Talk About What He Thinks Is Wrong With Obamas Plan! I Will Do What Is Best For My Country And Vote For Obama! CNN. There you go again... Making your headlines tilt in the dems favor ALWAYS. when, in fact, all the recent polls show a tightening and uptick for McCain and downturn for Obama. Please, at least, try and be accurate and truthful. Hillary and Bill will quickly jump on him. Can't wait to see this. ALL OBAMA SUPPORTERS...PLEASE GO VOTE AND GET OTHERS TO VOTE AS WELL. DON'T BE FOOLED BY THESE REPUBS AND THEIR EVIL WAYS!!! !